Madhobi-lota or Madhabi (hiptage benghalensis, family: malpighiaceae) is a large climbing shrub with woody stem and extensive branches. The perennial leafy climber can climb up to 5 m. In Bangla literary works, the vigorous climber is very famous for its sweet-scented flowers. 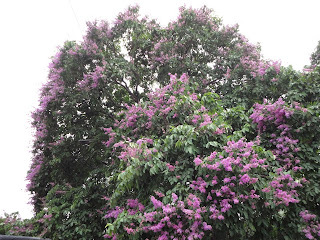 The deciduous climber is found in the hilly areas of Bangladesh. Although it is rare in its original habitat, it has become popular to the gardeners of the country recently. Flower blooms in large bunches in the spring. Blooming period is very shortened, lasts only for 2 weeks. Leaves are glossy green, petioled, elliptic, 10-15 cm long, opposite, leathery. Flowers are strong scented, white to light yellow, 3 cm long, on axillary panicles, silky outside, pale yellow inside. Sepals 5; petals 5, four of them are equal in length and white in color, the rest one is smaller and its color is yellow. Stamens 10, one is bigger. Dry fruits are 3-winged, They fly through these wings in order to increase the population. Seed is woolly. The plant is propagated from cutting from green wood. Gardeners can grow seedlings from its seeds. It is grown in parks, gardens and homestead for flowers. It needs strong support for trailing or climbing. Leaves, flowers and other parts of the plant are used in tumour, worm, rheumatism, asthma, cough, fever, rickets, stomach disorder, urinal problem and skin diseases. Leaf juice is used to kill insects somewhere. Juvenile leaves are reddish and very shiny.